One effort might be to stop stolen and looted Egyptian cultural material from crossing the American border. [...] The Cultural Property Implementation Act (CPIA), 19 U.S.C. 2601 et seq., implements the 1970 UNESCO Convention on the Means of Prohibiting and Preventing the Illicit Import, Export and Transfer of Ownership of Cultural Property. Section 2603 of the CPIA permits the President to enact import restrictions on cultural materials illegally removed from a country during an emergency situation without requiring that country’s government to make a formal legal request. Hooray for the President, eh? Congressmen in the US can openly support the import of illegally exported artefacts, but the President can decide by himself to act to stop it in certain cases without it having to go past the noses of any cultural-property-greedy Philistines. This seems like one of them. Senator Charles Grassley introduced emergency legislation in 2003, pursuant to the CPIA, in response to the looting of the National Museum of Iraq. The time is ripe to consider similar legislation in response to the reported looting currently occurring in Egypt. St Hilaire suggests that temporary import controls should be established by enacting an Emergency Protection for Egyptian Cultural Antiquities Act, which could supplement authority already existing under the federal criminal code (and some would argue the Archaeological Resources Protection Act). But then, why do the Americans need a CCPIA which implements just Article nine? This whole "system" reeks of inconsistency and senseless duplication while leaving a huge (arguably the most important) area not covered by any enforcing legislation. Time to re-debate the 1980s US approach to "cultural property protection" and its ability to take the moral lead in the light of the current form of the antiquities market and the global situation and not that of several decades ago. It is difficult trying to follow the often conflicting news that is coming out of a country with media which have been shut down and restricted and government-run media being a major source. 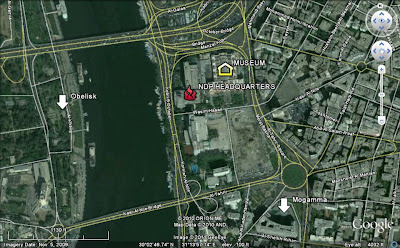 Egyptological Looting Database 2011: A Site by Site Database of the Damage to Antiquites in Egypt on http://egyptopaedia.com/2011/, run by Kate Phitzackerley "The site was established to respond to the fast-moving situation in Egypt. It is a working site, so please don’t expect lots of refinement. Information is provided on a best endeavours basis, but until the situation normalises little can be guaranteed". Vignette: not a looted head. Returning to the present troubles - sadly, some of the 'radical archaeologists' must be rubbing their hands with glee. I consider that to be highly insulting to all those who care about the preservation of archaeological sites and monuments (and not just because I am named in that post). Many of us are wringing our hands in utter despair to imagine the wanton destruction and dismantling of monuments and collections to serve an ever-greedy and undiscriminating market. My heart is broken and my blood is boiling. I feel that everything I have done in the last nine years has been destroyed in one day, but all the inspectors, young archaeologists, and administrators, are calling me from sites and museums all over Egypt to tell me that they will give their life to protect our antiquities. The people who may well be "rubbing their hands with glee" would be unscrupulous no-questions-asked dealers and collectors anticipating another windfall of looted material to come onto the market, like after the looting of archaeological sites in Bulgaria and then Afghanistan and Iraq. I cant see anyone like that dedicating their lives to protecting anything, except their own interests. With regard to my last post, I am hearing unconfirmed reports from Polish colleagues this evening that suggest there has already been some attempted archaeological looting in the Luxor region, so far I've only got this at second hand, but tomorrow hope to contact the Polish Mission and will try to find out more. The West Bank, where the mortuary temples and the Valley of the Kings are located, is without any security, with only villagers trying to protect the sites. “All the antiquities in the area have been protected by the locals all night, and nothing has been touched,” Mostafa Wazery, director of the Valley of Kings at Luxor, said. leaving aside that this is not, I think, his actual title (he is in charge of a broader area), there is now no village in the necropolis, the locals have been resettled in the past two years. There are still houses down the south end, towards the Valley of Queens and Medinet Habu - so where the tourist police post is (UPDATE: I later learnt that the latter and the 'gaffirs' just packed up their things and deserted their posts for one night, but came back in the morning). Note the same theme as the human chain around the museum story, locals coming together to defend their past. It may however be more complex than that, only isolated scraps of information are getting through. According to Monica Hanna, an Egyptian Egyptologist, many other cultural sites have been abandoned by the police. “The Coptic Museum is left without security, as well as the areas of Memphite Necropolis south of the Pyramids. One can only imagine what is happening at the sites in more remote areas in Lower Egypt,” Hanna told Discovery News. Reports also are circulating about looters at the Supreme Council of Antiquities’ storage magazine in Qantara Sharq, as well as some other magazines in South Saqqara. Indeed, Abusir and Saqqara are reported to have suffered great damage. “All the sealed tombs were entered last night. Only the Imhotep Museum and the adjacent central magazines are currently protected by the military. Large gangs are digging day and night everywhere,” Hanna said. Zahi Hawass picks up the story. He relates how he was receiving messages all night from the inspectors at Saqqara, Dahsur, and Mit Rahina. The magazines and stores of Abusir were opened, and there was nobody to be found to protect the antiquities at the site. At this time I still do not know what has happened at Saqqara, but I expect to hear from the inspectors there soon. East of Qantara in the Sinai, we have a large store containing antiquities from the Port Said Museum. Sadly, a large group, armed with guns and a truck, entered the store, opened the boxes in the magazine and took the precious objects. 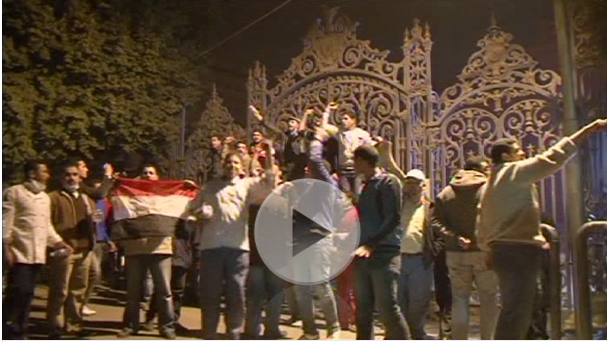 Other groups attempted to enter the Coptic Museum, Royal Jewellery Museum, National Museum of Alexandria, and El Manial Museum. Luckily, the foresighted employees of the Royal Jewelery Museum moved all of the objects into the basement, and sealed it before leaving. "immense damage to Abusir and Saqqara, all magazines and tombs which were sealed were entered last night. Only Imhotep Museum and adjacent central magazines protected by the military. In Abusir all tombs opened. large gangs digging day and night everywhere. The damage is *vast*"
It seems that some of the storage magazines at South Saqqara and Abusir have been looted - hard to say how much was taken and the extent of the robbing. SCA representatives are only today able to check on the museums/storage magazines, but early reports suggest major looting. 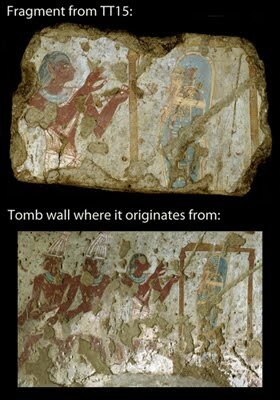 If you all could please contact anyone who can help and put them on "high alert" for Old Kingdom remains and Egyptian antiquities in general, and please spread the word to law enforcement officials worldwide. Egyptian looters (who may be encouraged by outside Egypt entities) may try to use the general confusion to get things out of the country. Other bad news: prisons in Qena and Armant (next to Luxor) have been emptied, so people fear major looting will occur in that region. 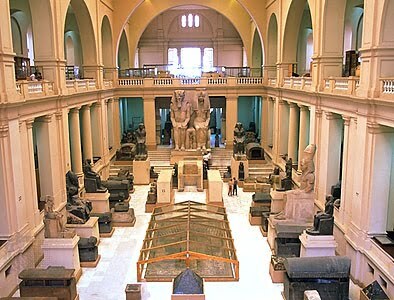 Reports still abound for major looting in the Alexandria Museum---but those reports are hard to confirm. The violence has been worse in Alexandria, and there have been few police reports there." The Museum in Memphis and its storerooms were completely robbed on Saturday morning. The leaders there called me in desperation and prayed: “Save us, do something.” I first called the police, but did not respond. I alerted an Army General, I know. But it was too late. The museum at Memphis most displayed sculpture, so it is not clear at this stage what "completely robbed' actually means, though the storerooms would presumably have contained smaller "portable antiquities". [Of course Mr Jarman should note that the Tutankhamun and the Deir Cache mummies (if that is indeed what was involved here) were not "repatriated", but I bet the looters were jolly well intent on sending them outside the country to could-not-care-less collectors and dealers. People who use arguments like those of Jarman and de La Fe do not seem to be adverse to helping scatter them - for "safety" we are to understand]. These individuals with their colonialist attitudes forget the reason for looters taking old bits of coloured stone and wood is to sell them to those who will pay largish sums of money for them no-questions-asked. Could the three wooden statues from Tutankamun's tomb have been sold to an ethical dealer or collector? Or the mummy heads? Without a market for these things, the looters would stick to looking for computers, office chairs and canned food. Reports are coming in that attempts are being made to protect monuments all over Egypt in case antiquity looting breaks out. Many news media are mentioning that access to the pyramids is being prevented. I suspect this is not so much to protect the pyramids (and associated mastaba cemetery) as to keep adventurous tourists stuck in Cairo from wandering too far. To get to the pyramids they would have to cross an area where there has been a lot of unrest these past few days, and obviously the more scattered they are, the more difficult they are to protect (and protecting its visitors is one of the things the Egyptians are very serious about). In addition, the mastaba tombs and their reliefs are particularly vulnerable to looting (a la TT 15 Tomb of Tetiki style). Let us not forget also that Zahi Hawass has a personal interest in the Giza cemeteries. Unfortunately there are huge numbers of sites which are vulnerable to the same kind of antiquity robbing as civil order breaks down. Sites which have elements that can be broken out and turned into saleable "portable antiquities". I'd suggest reliefs on blocks are the most suitable for this. A mob can break into a temple or tomb with crowbars and in a matter of half an hour or so get some pieces of "ancient art" off the walls and into knapsacks. Museum and excavation stores are full of bits already loose, ready for looters to take their pick. I'd predict that Saqqara is one site which needs to be guarded especially well in coming days, weeks (and who knows, as the national stability carefully built by Mubarak founders, much longer). These of course are full of lootable and saleable objects (as is the Luxor temple and lesser-known Medamut complex nearby). There has been no mention of the West Bank - apparently some foreign missions were at work there yesterday (especially as the area around the necropolis is depopulated due to the removal of the village here in the last two years). If civil order breaks down here, these sites are especially vulnerable. I'm not only worried about the monuments, but the people looking after them who I got to know during my wanderings around the necropolis. All of them charming and friendly people, living in shifts in huts scattered around between the tombs and temples. Here's one of the three or four gentlemen recently guarding the Seti I temple (photo: PMB Dec 2009). If a mob of 90 blokes with crowbars decided they were going to break into a storeroom (and there are many scattered over the necropolis of varying degrees of sophistication and security) or a tomb or two to see what they could get their hands on, there is no way a few dozen guards could offer any resistance. How long would it take for the police or army to respond to their call for help (I did not see any radios in their guardposts when I drank tea with them - neither do they seem to be armed). There is a small group of armed tourist police guarding the Hatshepsut Temple and there is a police station by the Antiquities Services offices at Medinet Habu. Most of the police stationed actually in the necropolis itself are in outposts which are distant from the areas more approachable from the east (like half-way up the mountain). The Antiquity service is in the process of building a boundary wall around the eastern side of the central part of the necropolis, but its easy to hop over, it serves a demarcation purpose rather than intended to keep armed mobs out. There is now much better floodlighting (the cables put in last year without any kind of archaeological supervision I could see), but its no use being able to see tomb robbers and looters if you can't stop them. If these sites are looted and stores are broken into in the next few weeks, we will have to be very alert to the appearance of the items on the market. The effects of the appearance of fresh unprovenanced material on the market will mean we will have to look very critically at all the unprovenanced material of Egyptian origin and type on the market, scarabs and shabtis included. And coins of course - maybe the new Egyptian government can ask the US for a bilateral cultural property agreement for all those years of mutual support and friendship. UPDATE: How little did I suspect how rapidly these predictions would, sadly, become reality. Thousands of protesters defied the curfew for the second night and Cairo's central Tahrir (Liberation) Square remained filled with protesters. Troops and armoured vehicles have been deployed across the city to guard key government buildings, and major tourist and archaeological sites. Despite heavy security presence, at least two looters managed to get into Cairo's museum of antiquities and damaged some of the exhibits. Thieves broke into the Arab International Bank and several cafes and eateries. To protect their property from looters, residents of the city set up committees armed with guns, clubs and knives. It is not clear at this stage if this is a garbled reference to the looting of Friday night. It seems likely that this is the case, and it is citing earlier preliminary statements by Hawass that "two men" were involved in the attempted theft of items on Friday. Meanwhile more details are emerging about Friday's attack and again are reported in updates to Veken Gueyikian and Hrag Vartanian's stunning coverage 'Breaking: Images of Egyptian Museum Damage [UPDATE 34] King Tut Objects Damaged?' in their Hyperallergic blog. Germany’s ZDF television has reported that a high-ranking member of the ruling National Democratic Party was involved in the attack on the museum, which holds some of the country’s most important historical artifacts, including the King Tutankhamun exhibit. I can confirm: german TV ZDF reports acording to eyewitnesses that high NDP officials have been involved in looting the museum last night. Anyone in cairo to confirm this? There is a presumption that Farouk Hosny, Minister of Culture is one of those government ministers who lost their posts on Saturday (though his rather nice website is still active, understandably in the circumstances, it has not been updated to cover the most recent events). If that is the case, perhaps the people responsible were in some way directly subordinate to him and felt that their days as part of the ruling elite were numbered. This is pure speculation and we can only hope more information will emerge. UPDATE 33: Sat. Jan 29 7:37pm EST: King Tut Objects Damaged? After Gueyikian and Vartanian's post, the original The Eloquent Peasant blog post was updated with the information that a third Tutankhamun statue was visible as having been broken in this disaster - this is worrying because reports state that when captured the robbers were found with two statues, where is the third? The dark coloured statue lying near the broken base in the video seems not to be one of the Tutankhamun ones (a MK tomb model?). What else was broken and taken that is not in the Al-Jazeera video? 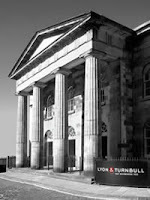 Update: good coverage of Maitland's detective work by Alan Boyle of MSNBC: "Were Tut's treasures damaged?". This contains a quote in the update, Zahi Hawass says: "They tried to attack and rob from the showcases of King Tut, but they failed," Hawass is further quoted as saying. "These people are criminals, they are not true Egyptians. The nine men were caught carrying skulls and two statues, one of which was broken. But the army are now guarding the museum and all the museums are now safe." Also Sunday evening Zahi Hawass gives a slightly different account of Friday night's events in the museum. Possibly the discrepancies between his varying statements throughout the day reflect difficulties even he had in the chaos in getting reliable information about what had happened the previous night. 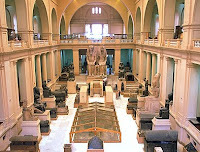 There is a useful plan of the position of the damage and looting in the Cairo Museum on the Ancient Egypt Online blog. On Friday night (28th) the National Democratic party headquarters was entered by a mob, who looted it (carried off furniture and computers etc) and then set it on fire. This building stands right next to The Egyptian Museum overlooking Tahrir Square in Cairo’s city centre. The building continued to burn on Saturday into the evening and there are fears it might collapse onto the museum (the smoke is not doing delicate organic artefacts in the museum much good either). In comments to the Al Arabiya television channel well-known Egyptian film director Khaled Youssef had called on the army to ensure the museum was protected. Then dozens of would-be thieves started entering the grounds surrounding the museum, climbing over the metal fence or jumping inside from trees lining the sidewalk outside. One man pleaded with people outside the museum's gates on Tahrir Square not to loot the building, shouting at the crowd: "We are not like Baghdad." [...] Suddenly other young men — some armed with truncheons taken from the police — formed a human chain outside the main entrance in an attempt to protect the collection inside. "I'm standing here to defend and to protect our national treasure," said one of the men, Farid Saad, a 40-year-old engineer. Another man, 26-year-old Ahmed Ibrahim, said it was important to guard the museum because it "has 5,000 years of our history. If they steal it, we'll never find it again." Finally, four armored vehicles took up posts outside the massive coral-colored building in downtown Cairo. Soldiers surrounded the building and moved inside to protect mummies, monumental stone statues, ornate royal jewelry and other pharaonic artifacts. The soldiers appeared to have rounded up all the would-be looters who made it onto the museum grounds and had lined them up in a row. As the soldiers corralled one man toward the line, crowds outside the fence shouted, "Thief, thief!" A couple the troops then hit the man with the butts of their rifles and sat him down with the others apparently caught inside. Then it seems that a human chain was formed by concerned citizens outside the museum, to keep would-be looters out. Meanwhile some armoured cars took up positions outside the museum and Egyptian army commandos secured the building and its grounds early Saturday morning. and destroyed two Pharaonic mummies, Egypt’s top archaeologist told state television.[...] "I felt deeply sorry today when I came this morning to the Egyptian Museum and found that some had tried to raid the museum by force last night,” Zahi Hawass, chairman of the Supreme Council of Antiquities, said on Saturday. "Egyptian citizens tried to prevent them and were joined by the tourism police, but some [looters] managed to enter from above and they destroyed two of the mummies,” he said. It was unclear at this stage whether the mummies destroyed were royal mummies or not, or which mummies they were. "They managed to stop them," Hawass said. He added that the would-be looters only managed to vandalize two mummies, ripping their heads off. They also cleared out the museum gift shop. He said the museum's prized King Tutankhamun exhibit, which includes the boy pharaoh's gold death mask, had not been damaged and was safe. An Associated Press Television News crew that was allowed into the museum saw two vandalized mummies and at least 10 small artifacts that had been taken out of their glass cases and damaged. Zahi Hawass told the media on Saturday that the men had been caught and detained by army soldiers, and that they had not stolen any of the museum's antiquities, and that the collection was now safe and under military guard. Hawass said he believes the artefacts can be reconstructed as nothing was removed from museum grounds. were forced to leave the mummies behind when they broke into pieces as they carried the ancient artifacts towards the museum doors. A reporter from Al-Masry Al-Youm’s Arabic edition saw the damage this morning and Al-Arabeya news channel has been showing the first footage shot within the museum Saturday afternoon. Glass display cases were broken, although the ancient Egyptian jewels inside were not taken. Statues were broken into pieces and sarcophagi were displaced. Zahi Hawass, the Head of the Supreme Council of Antiquities, made a statement this morning that all the artifacts were still in the museum, although many had been broken. According to Hawass, about 1,000 people looted the museum's gift shop and grounds. Later nine people carrying mummy skulls were arrested as they tried to leave through emergency exits. it is not clear if these were the individuals seen being beaten by soldiers mentioned in the earlier report. "Things You Can't Take Back"
Welcome to Meg a student of anthropology and history at Bennington College who has just started up a blog "Things You Can't Take Back" ("The illicit antiquities trade and other cultural heritage issues. By a mouthy youth. For the mouthy youth"). We look forward to seeing her take on the issues, and wish her lots of readers. 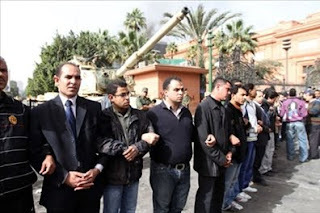 Egypt's "Angry Friday", January 28, 2011. . The New York Times has an interactive map of some of the places where protesters rioted and clashed with the police on Friday. 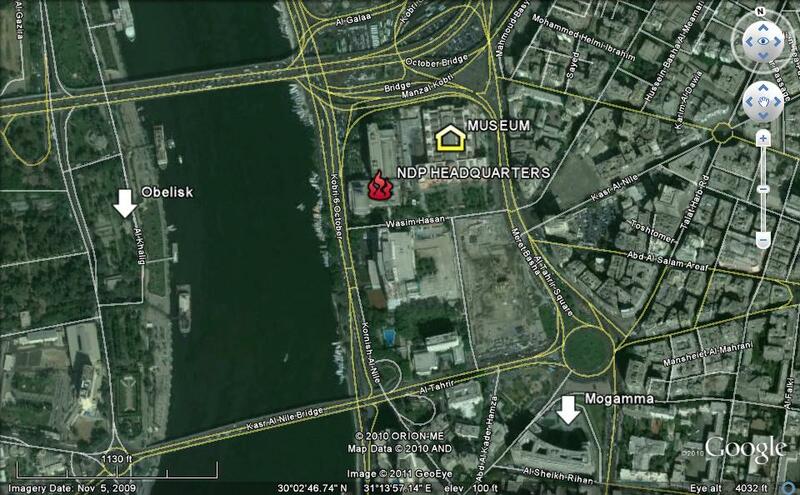 Here you can see the situation of the NDP headquarters which was reported as burning last night, parallel to and left of the Cairo Museum. You can see how close they are. The 'boot-shaped' building to the south of the roundabout is the 'Mogamma' - central government office where I am supposed to be sorting out a residence permit on Thursday, if we can get near it. [The NYT map also gives a particularly clear overview of the Old Town and its walls - on the World Heritage List]. A bit worrying, although the Polish foreign ministry is not yet advising citizens to stay away, the British Foreign office has just added Luxor, where I am due to go on Wednesday to the list of places where "non-essential travel" should be avoided, alongside the areas affected by rioting last night. 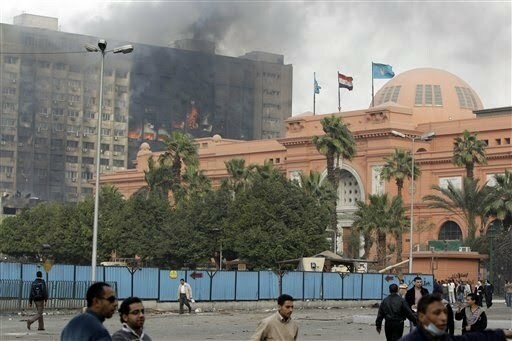 It was bad enough when my first stop (to arrange residence formalities because the Embassy here - bless them - gave a month visa for a six week stay ) is the government buildings in Tahrir Square that have been the focus of attack these past few days. Now it would seem from the Foreign Office advice that the situation in Luxor itself might not be as stable as I thought it was going to be. There is no contact with the Mission offices in Cairo of course, phone lines dead and Internet down since midnight on Thursday. I am not sure now whether I will be on that plane in just a few days now. Thinking of colleagues already there and several who are due to fly out today and tomorrow. UPDATE Saturday (Saturday, January 29, 2011): Kate Phizackerley's 'News from the Valley of Kings' blog has some useful information. This includes a phoned report: Jane Akshar Speaks from Luxor sent out on Friday it seems. I'm glad to hear that Jane is safe and so optimistic. My thoughts are with you all. Egypt: Ruling party's headquarters in Luxor torched By JPOST.COM STAFF 01/29/2011 14:56 The ruling party's headquarters in the Egyptian city of Luxor was torched as tens of thousands of protesters gathered in defiance of a curfew that was set. There is a forum thread here Luxor Forum: Is there trouble in Luxor? that I shall be watching. The Djehuty project dig diary ends abruptly on Thursday. Government agents raiding alleged Four Corners artifact looters in 2009 set off a sharp backlash among some locals and lawmakers, although prosecutors and judges have since taken criticism for going easy on the defendants. It turns out most Utahns say the government was right to crack down. A new statewide Salt Lake Tribune poll shows nearly two-thirds agree the sweep was justified, while fewer than a quarter say it wasn’t. Nearly half (48 percent) say the probation sentences handed out so far have been fair, but 33 percent would have preferred stiffer punishments. “Ancient artifacts are more for the public to view in a museum instead of selling them for a profit,” said David Johnson, a poll respondent from Kaysville. The survey of 625 registered Utah voters was conducted by Mason Dixon Polling & Research from Jan. 17 to 19. One wonders what poll results would show in other parts of the States or concerning the no-questions-asked sales of items potentially looted from archaeological sites in other countries across the Oceans. The rest here: Brandon Loomis, 'Poll: Nearly two-thirds of Utahns back crackdown on artifact looting', The Salt Lake Tribune 29th Jan 2011.
the intention of the AIA and its minions in the State Department is clearly to work toward gradually expanding import restrictions until they apply to all ancient coins. It is also not what the CCPIA says, so here Welsh is trying to provoke alarm by making things up. See my post here for his ACCG sidekick Tompa doing the same kind of misleading. But the next point is really ridiculous. Meanwhile importers will be required to satisfy a requirement to provide an export permit from the state with which the relevant MOU was negotiated, or evidence that each item involved was outside that state on the date the MOU was agreed to, or ten years prior to the date the item was shipped. The exact nature of such documentation is not specified, however in the past Customs has shown a strong bias toward photographic evidence. It would be wise for US collectors and dealers to whom coins are shipped from auction houses and dealers outside the US to obtain agreements from their sources that the documentation necessary to satisfy Customs will be sent with the coins. At this moment, it is unfortunately not clear as to exactly what form of documentation will be required. It seems to have escaped Welsh's attention that the trade in antiquities does not just consist of his beloved coins. Dealers in other types of antiquities, Greek vases, classical statuary, terracottas, intaglios and seals, glass, pre-Columbian antiquities of various types, not to mention ethnographic material, all of it coming from the dozen or so countries with which the US already has functioning MOUs manage to get their stuff through without making all this fuss. The CCPIA has existed since 1983. 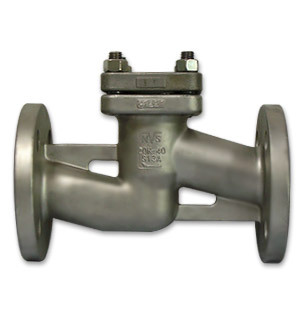 These problems have been faced and overcome by other US dealers since 1983. The US market has not been depleted overnight by all the types of artefacts covered in existing MOUs suddenly disappearing, the MOU has not acted as a 'check valve' or had the dire effects Welsh predicts. Ah, well, the coineys will say "coins are different". No, no they are not. They differ only in one respect, the people who deal in them behave like they are a specific breed, with a petulant-child-like mentality intent on kicking up a fuss about everything, quite unperturbed by the impression they are making. If they do not understand "what kind of documentation" is needed, perhaps they need to join some kind of antiquity dealers' association and learn from its members. Quite obviously they are not going to get this information from the ACCG, which seems either totally lost, or permanently intent on disseminating misinformation among collectors and other dealers. UPDATE: Summing up all his reserves of personal culture Dave Welsh replies in a post called: 'Barford the Ignoramus' and here's another one, 'Barford: A Frustrated Talent' with the inevitable Nazi parallel. I can't really see there any explanation of why he thinks the CCPIA does not state what kind of documentation (two types) is needed to import cultural property into the USA covered by the provisions of the Act. But I guess getting that straight was never the ACCG's intention. "Provide their services" to COMMERCIAL artefact hunting rallies. Straight from the PAS website. As for Finds identification days, see this http://finds.org.uk/events/archives; The past 12 Finds identification events attracted a total of 44 people..As I said, there is little chance the Bloomsbury set will say a word against rallies in view of that. But what kind of "public outreach" is that? Perhaps the public wants and deserves more than a finds identifying outfit for all the money they are spending on the PAS. Metal Detecting Vacations (UK) ("come and discover a piece of England" [and take it away with you after paying me lots of cash]) is run by an American immigrant called Tony Golden, now based in Sale. He has been in England five years and sees a business opportunity exploiting the country's lax heritage laws. So how would that look if Mexicans moved in to the US to dig up and export all the remains of America's past? After the detecting tour has ended you are required to place all your finds identified over 50 years old in a finds bag with the finders details clearly marked upon it. MDV (UK) will then work with (sic) the local find liaison officer in recording the finds. If any of the artefact's (sic) are found to be of historical importance they will be recorded by the portable antiquities scheme where experts will ID and record the item giving you a greater depth of information. Who pays for that? The punters have paid Mr Golden for this service, but the PAS do this for free. Well, not really for free is it? This is done from public funds. The British public are paying archaeologists to provide nice reports for the clients of firms like Mr Golden's commercial operation engaged in the digging up and export of bits of Britain's archaeological record for cash. We've come a long way from the PAS being involved in instilling best practice (this kind of exploitation of the archaeological record is not by any stretch of the imagination "best practice") and we've come a long way from the notion that by working with artefact hunters there is some kind of engagement with the past of people who are investigating the history of the area they live in. The FLOs do not even meet Mr Golden's clients, just see a jumbled bag of their finds and produce reports for them free of charge. Do the PAS support organizations such as Metal Detecting Vacations (UK)? Should they not be making this clear? Is this what the PAS consider "responsible detecting" (ie responsible use of the finite archaeological record)? Should the PAS not be making a charge for their services when they are exploited by commercial organizations like this? Should not British archaeologists be doing more to try and stop this kind of thing? A Deep Bloomsburian silence will ensue I am in no doubt. But I hope the purse string holders will hear the echo of this silence and wonder just what is going on. PAS is supposed to be doing outreach, isn't it? How can it do that by remaining silent? For purposes of this title [...] (2) The term "archaeological or ethnological material of the State Party" means [...] any object referred to in subparagraph (A) or (B); which was first discovered within, and is subject to export control by, the State Party. The deliberate omission of the end of that sentence obscures the fact that the CCPIA does not apply to artefacts which are not covered by the export laws of the state party concerned - ie with which the USA has entered a bilateral cultural property agreement. A coin of Italian type dug up in Romania or Bulgaria and exported to the US is subject to the export laws of Romania or Bulgaria and not Italy. In other words, even if clandestinely illegally excavated from an ancient site with dynamite and bulldozers and exported by the vilest of drug and white slave peddling mafia, the artefact will nevertheless pass on its way to sale in the US, unhindered by the barrier of bubbles that is the customs border of 1970-UNESCO-Convention-Party USA. This is merely because it is not covered by an MOU agreed on the basis of the CCPIA. Because of the existence of the 1983 Ronald Regan epoch CCPIA, the USA does not officially recognise that Bulgaria and Romania have a problem with the illegal export of cultural property. The problem does not exist. US hypocrisy imagines that the world will believe that the country now with one of the world's largest markets for potentially looted and smuggled dugup artefacts actually has an International Cultural Property Protection Program. That's a laugh. Even the pathetically inadequate legal measures they have can barely be enforced because cowboy dugup antiquity dealers and their supporters are kicking against them and loudly refuse to even make a pretence of behaving responsibly and agreeing to respect the existence of and abide by the laws. Surely it is time for America to assert some of that moral leadership it is always banging on about. 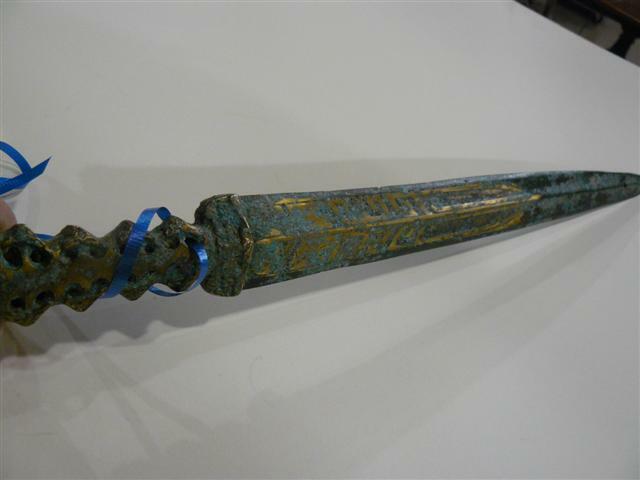 "Product (sic) 54/64": Shang Dynasty Sword: 4,000 Year old Bronze Shang Dynasty Sword Acquired by U.S. Military during a tour of Iraq from one of Saddam Hussein's Palaces. Museum Piece and Gallery 63 has it!" What does it mean "acquired by U.S. Military during a tour of Iraq "? You mean pure and simple looted by U.S. Military. A museum piece - looted by US soldiers from an Iraqi museum. Well, as Donald Rumsfeld famously said "stuff happens" in a US led invasion of a sovereign country. Auction is on Sun, Feb 13th @ 11am. A reader has drawn my attention to another group of UK metal detectorists organizing commercial artefact hunting "meets" which is using the "grass" template with cannabis leaf logo which we saw on the Hunterscorporate website. This one is Sussex Heritage Hunters run by Andy Paxford, Bognor Regis, West Sussex. They go out hunting 'club sites' "at least twice a month on a sunday, land and weather permitting". Here are the "club rules" - "no drugs" it says, but nothing here about the Code of Practice for Responsible Detecting or recording finds with the PAS. Like the "Hunters" it says ALL finds will be "shown" to the landowner, but there is nothing enforcing this in the club's membership rules. The links page does not go to any site connected with finds recording - but it does go to this, but more significantly Sussex Coins and Antiquities. I have coins and artefacts from Celtic right through until the 18th century, most of the items are found within the British Isles, but some come from places in Europe and this will be stated within the description". Well, it does not, not normally, in fact for very few of the pieces is any kind of provenance mentioned, some say things like "found in Nottinghamshire". I did not find a single find offered by Mr Garrett which had a PAS number. I found a gold coin of Anastasius ("found Hampshire") which seems not to be in the PAS database. I was bemused by what the dealer considers to be "Bronze Age artefacts". More to the point I was a little puzzled to see presented as British metal detector finds the sort of things that are coming from "Balkan" sources (though its difficult to tell as the pictures are so small and indistinct). Is this dealer sure he really knows where the stuff people are selling him comes from? Terry garrett's web-based shop has no logo indicating membership of any antiquity dealers' association, no mention of a code of ethics, no assurances of legal origin of the finds offered from "places in Europe". It does say however that any finds found not to be genuine will be refunded - rather odd for somebody selling fresh metal detector finds isn't it? (To have one and not the other). No mention I could see of export licences for shipping abroad either. So what does Sussex Heritage Hunters consider "responsible" detecting? From their website it seems to consist ONLY of: No night-time detecting or visiting 'club' sites alone, filling in all holes, shutting gates, reporting damage to farm property, wearing headphones, no drugs or booze while tekking, searchers must be NCMD/FID members. That's it. None of that other nonsense about "best practice" that other definitions of "responsible detecting" contain. Stay off the booze, fill in yer 'oles and shut the gates, and there'll be no archaeological damage done at all, eh? And anything nice you find, Terry Garrett will no doubt be willing to make a fair offer. I do not know if you can read this 'Business innovation' page from Farm Busines magazine of 17th December 2010, if you can't its probably just as well for the blood pressure of all who care... . 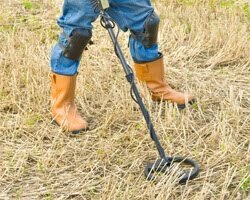 The business plan contains some interesting numbers: "About 30 000 metal detectorists dig at least twice a week in the UK " (that is three times the Heritage Action estimate - you know that Erosion Counter everybody says is excessive). Furthermore "Demand is forecast to grow by 25% per year" (so by the end of the decade there will be 105000 of the blighters? Thirteen times the current HA estimate). This is assigned to the fact that "valuable finds are well reported in the media" (let us note: often by PAS press releases, unbelievably there were even plans to make a TV series about this with PAS involvement). In this commercial Treasure hunting operation, land will be ‘graded’ depending on what historical resource it has in it and (since the archaeological record of any piece of land is a highly finite resource) „how much it has been detected on” in the past. The revenue will come in from ticket sales - the article shows what enticingly high sums can be raised by giving this organization a monopoly to search this land. The organization is called "Hunters Corporate", Barry Wayne, Mark Becher and Victoria Bosworth. It is obviously related to this: Hunters Events UK and Hunters of Hertfordshire. they even say they have Codes of conduct - but there's inexplicably ONE MISSING, ISN"T THERE? "The hunters corporate events finds division agreement is written into each landowner/farmer and detectorists contract and states that any items recovered from the ground on a hunters event are subject to this agreement. 40% for the landowner, 40% for the finder & 20% for hunters corporate events". But nothing for the PAS which is expected to be part of the hunters' business plan for free. Well, everybody else pays for that, so the hunters can make money by selling off the past, don't they? But then, where's the fifty-fifty finder-landowner split that Treasure finds normally attract? Both landowner and finder are agreeing to a 10% cut. What about non-Treasure finds? Do Hunterscorporate give landowners 40% of the market value for every collectable removed from their land? How would they administer that? Or are they just going to reimburse the landowner for 10% less than they'd get from the Treasure Valuation Committee in the case of Treasure finds and the finder walks off with the rest? They do say: "the land owner gets the very best treatment from the detectorists and will also get their share in all finds made", which rather suggests that having bought tickets, the finders either have to surrender all their finds to be sold, or pay the landowner 40% of the value of each and the "Hunters" another 20% of their value to take them home. What's in it for them then? Why not just go to a normal commercial rally held on 'prime land' where they can just keep all the non-Treasure items they find with no extra cost? Would it not be too much to expect that the PAS might say a few words about the scope and nature of their proposed involvement with commercial operations of this sort? Should they not - like any archaeologist that abides by a code of conduct - be contacting landowners (like through their trade magazines) trying to STOP just this sort of exploitation of the archaeological resources of their land? Otherwise one might suspect that they see organized events like this as a good opportunity to get "more finds on the database" with minimal effort. Surely promoting best practice comprises a bit more than that? Do "Hunters Corporate" enjoy the support of the Portable Antiquities Scheme, or is the Portable Antiquities Scheme going to come out publicly and condemn this kind of exploitation? [A Deep Bloomsburian Silence ensues]. Vignette: Hertford metal detecting wannabe-monopolists Mark Becher and Barry Wayne trying to look like mafiosos with a business plan in green wellies and flares. Have a look at this video, pay special attention too to the soundtrack (Holst, Zimmer/Da Vinci Code, Greensleeves remix). Never mind the seal, pay attention to the deposit of three paterae at the beginning. Dug out from below plough level, hoiked out of obvious stratigraphic context. It was found whole, could have been properly excavated and lifted, but has instead been fragmented and roughly cleaned by the time it gets to a pub-meeting with the FLO. Note how the latter gives the finder a good talking to about "best practice" (not). Is this the way to preserve the archaeological heritage? What on earth are PAS doing here? Where is the promotion of the Code of Responsible practice in this? Who gives a damn that the FLO has got a drawing and measurements of a patera when it is produced at the expense of trashing the archaeological context in which it had lain for nigh-on two thousand years? And no, Mr Collins the handle was not "welded aan" to the body of the "pot". The Treasure Act urgently needs revision so that things like this and the Crosby Garrett helmet do not slip through and people thoughtlessly damaging the archaeological record like this are penalised. As the person, member of the PAS' great British public (and not even a member of Heritage Action) who sent this to me remarked,"I actually feel like I’ve been mugged [...] can you imagine the loss of information from around and within that delicate pan? [...] for me, some of these clubs are run by the lowest dregs of society, especially as they can’t really plead ignorance as the FLO obviously attends their club meetings. It looks more like a meeting of Fagan’s thieves waiting to divvy up all the proceeds of a heritage crime". That's a view of a member of the public of PAS "partnership" in action. Mr Collins, what are you doing? What are you achieving here? Why is Britain paying archaeologists to lend support to activities like this when all the codes of ethics say archaeologists should be doing their best to stop it? Also, are we really expected to believe the seal came from the hole shown at 7:16? Certainly that seems a boast about the "depth advantage" which suggests the extent of the destruction these people are capable of doing. U.S. Government Notions of Conservation? The US no-questions-asked market for dug-up antiquities is one of the largest in the world, accounting according to some observers for half the global demand. Yet the legislative response to the crisis this creates is utterly half-assed, and what measures there are are even being undermined by legislators in cohort with the principle exploiters. Why need this surprise us, given the general myopic exploitive attitude the entire nation seems to have to the natural resources of this planet? ...plus tens of thousands of crows, doves, ducks, falcons, finches, gulls, hawks, herons, owls, ravens, sparrows, swallows, swans, turkeys, vultures and woodpeckers, among other animals. [...] also murdered in 2009 by the USDA are victims of other species: 27,000 beavers, 1700 bobcats, 81,000 coyotes, 2,000 gray foxes, 336 mountain lions, 1900 woodchucks, 130 porcupines, 12,000 raccoons, 20,000 squirrels, 30,000 wild pigs, 478 wolves. And hundreds of thousands of foreign and domestic archaeological sites trashed all over the world so greedy morally-challenged collectors can fill their coin cabinets and living room antiquity display cases. 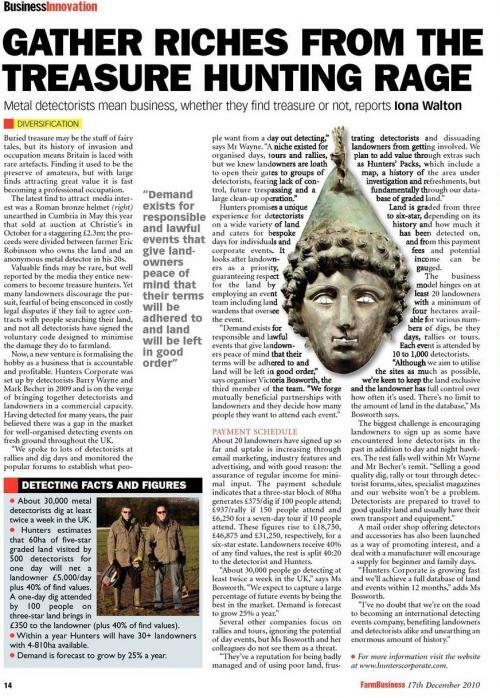 These are the people with which UK metal detectorists and antiquity collectors together with their archaeological "partners" are intimate bedfellows. Kill-happy Nebraskan farmers cannot actually work out they need to cover their feed? Well, of course when PAS (though I do not think they attended this one) relies on commercial artefact hunting rallies for achieving its 'aims', they are not going to speak out about them, are they? Commercial artefact hunting rallies concentrate hundreds of artefact hunters in one place busily engaged in hoiking hundreds of luvverly 'recordable' artefacts out of the archaeological record, and then line up at the PAS tables in the beer tent to show them. The FLO does not even have to get off his seat to add hundreds of new records to the PAS database ("that field over there? Right mate"). After all, the PAS presents itself to the public only in terms of ""whattalottastuff we've got"; the number of zeros after the number on the "number of objects on the database today" statistic is what is supposed to convince the stakeholders that the PAS is saving the past for the public. It is not. This is artefact fetishism, not a holistic process of heritage management. The PAS database is a sorry record of just part of a process of the denudation of the archaeological record by artefact collectors, day after day, week after week, month after month. It is not even honest enough to actually say that in those terms. The PAS is not "preserving sites" (Gill 2010), its not even talking about it as part of its so-called "outreach", far from it, it is watching on as this depradation goes on and the expansion of its database is a result of this activity. When are the British public going to be told by British archaeology what the rest of the world knows. What is happening in the fields out there is NOT archaeologically justifiable, it is NOT sustainable, it is simply wanton and largely unmitigated damage by selfish exploitive individuals of the archaeological record which (archaeologists say they regard as) the common heritage of an entire generation and the generations that will come after them. Except individuals are brazenly pocketing bits of it under the noses of the entire approving archaeological milieu. Now let those same archaeologists turn round and tell the public and purse-string holders that they need to fork out lots of cash for real archaeology because the fragile archaeological resource needs protecting from damage, what kind of arguments can they offer? None, I would think. Not honest ones. 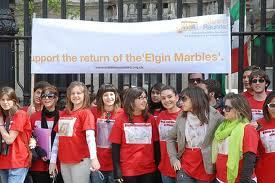 The global financial crisis is affecting the financing of heritage protection and monument upkeep all over the world. US antiquity collectors, ignoring to the parlous state and vandalism of monuments in their own country, have recently been kicking up a fuss about the state of ancient monuments in Italy and Greece, suggesting that they could look after the illegally exported portable heritage of those countries better than the state administration of those countries. Under the guise of selfless concern for the common heritage they of course merely want to selfishly garner armfuls of it into their own private possession. A somewhat more publicly spirited form of private sponsorship is a more helpful approach. In Italy it has just been announced that Tod’s, the luxury leatherware manufacturers has pledged $34 million toward the restoration of the Colosseum. The money will go on the cleaning and reinforcing the exterior of the monument, its circular galleries and some underground spaces currently off-limits to the public. Work will be monitored by the Culture Ministry and will begin by the end of the year and is expected to last between two and three years. Speaking at a news conference inside the Colosseum, Diego Della Valle, the founder of Tod’s, said he was pleased to be able to give something back to his country and pledged that he would not exploit the sponsorship for commercial purposes. “I hope other businessmen will follow suit,” he said. I really see no reason why he should not be able to (discretely) use this sponsorship to promote his business, this is common practice in my country, a firm sponsors the restoration of an historic building in the town centre and (apart from the tax benefits), the awnings covering the building (put up to protect the workmen from the rain and passers by from the dust and dirt caused by the stone cleaning) are used to support a huge and highly effective advert for the firm for the duration of the work. On reading this I was reminded of another Italian businessman from a related branch of industry who has thrown in his lot with the ACCG and been vociferous on the US political scene about the measures intended to curb the trade in cultural property illegally exported from Italy. The boss of Ermanno Winsemann Falghera s.r.l. cannot answer my question of whether he applies the approach he recommends adopting for dugup coins to his own dealings in the textile market . Maybe he could do his bit and at least show he nevertheless cares about Italy's cultural heritage by following the lead set by Diego Della Valle and sponsoring some major work on some monuments (like some of those of Milan where they are based)? Or perhaps they already do? Vignette: Tod's doing its part to preserve the cultural charms of Italy, while other local firms just give Italian cultural preservation the finger. Art Crime is destroying the record of the past according to Lyon & Turnbull, Scotland's oldest firm of auctioneers in an interview with ARCA's Noah Charney. A s many as three-quarters of art crimes involve looted antiquities, ancient treasures dug up by locals all over the world and sold on with false provenances via members of criminal syndicates. Professor Colin Renfrew, one of the country’s leading archaeologists, speaking in a national newspaper, described looting as “a colossal problem (which is) destroying the record of the past”. Charney advises collectors of antiquities to take particular care, especially if they are considering buying on the Internet. “I would say, never buy anything you haven’t seen or handled in person. You should also be given a complete provenance and be given an opportunity to check it out independently. Beware sellers who [...] withhold information. Bare-Faced Lies. Is it the US "Coin Trade" the Obama Administration is Trying to Stifle? I wonder how many people were saddened by the suggestion made by US sellers of ancient dugups from the soil of foreign countries that the "Obama Administration" was stifling the US coin trade? Coin collecting in the US has however never been so popular or profitable as it is today. Collectors can learn about the history and culture of their country by looking at the designs and researching what they depict. They can have a lot of fun. 147 million people collect the State Quarter series of coins alone, and under the Obama administration the mint is issuing a supplementary series of other territories and now national parks. There must be many tens of millions of people of all ages and walks of life in the US that collect modern world coins and banknotes too. Where is the evidence that the hobby of these 147 million people is being in any way penalised by the Obama administration? I would not mind betting even that there's a set of State Quarters tucked away in a drawer somewhere in the White House. There is a minority of US citizens, no more than a few dozen thousand strong at most, who - not content with the tens of thousands already in existing collections - claim the "right" (sic) to involve their country in the shameful trade in illegally exported ancient coins dug out by persons unknown from archaeological sites in foreign countries. Against the 147 MILLION other collectors this is a mere stain on the milieu as a whole. But they are a noisy bunch. In a recent press release they drag the name of decent law abiding collectors and dealers of all coins through the mud with their self-centred claim that a measure introduced to curb the trade into the US of illegally exported dugup artefacts is a blow aimed at the entire 147 million community of collectors and the dealers that supply them. It is not, it is a blow for culture pirates who have no regard for others. The decent law-abiding community of US coin collectors should come out and repudiate any connection with those who sully the image of the hobby by involvement in the trade in looted archaeological artefacts. All along the way, the coin dealers' lobbyists the ACCG has quite clearly deliberately set out to mislead its readership by what seem to be bare-faced lies, emotive soundbites and cynically applied pars pro toto tactics. It is clear that many fast-food and Disney-fed US collectors are failing to approach such arguments with the use of any of their critical facilities which makes them easy to mislead. Here is a very good example: A text grandiosely called: "A Major Threat to Coin Collectors, Buyers and Sellers" is about measures being adopted to clean up a small segment of the dugup antiquities market in the US. "..this is an issue that should concern ... every coin collector", "This should concern everyone who buys, collects or sells coins". Yes it is but not in the way the ACCG mean. Not everybody wants to buy looted coins, do they? "The entire hobby is being challenged". No its not, just the cowboys who want to sell and buy dugup ancients no-questions-asked. 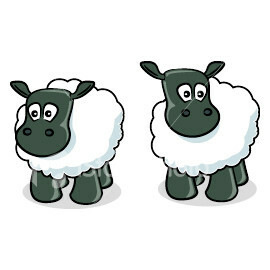 When are US coin collectors going to show they are capable of behaving unlike sheep led by the nose? What kind of a "Job" is that? Another Griffin like the Crosby Garrett one? Listen, Can you Hear Anything? Rigged Poll on "Metal Detecting"
Rory Tyler: "Rewrite the Artifact Law"